It's nice to be back to the good ol' routine. Spending time away from home was wonderful but it's also lovely to come back and feel refreshed. While the weather is something to be desired in SF (good ol' summer in SF is always like this), I'm enjoying being able to wear layers after being in Vegas weather. This weekend is also the music festival, Outside Lands. I live so close to Golden Gate Park (where it is held) that I can hear the music and the people when the event is happening every year. For a local, it can turn into a mad house. But, as everyone who lives around the area knows, we just roll with it. It's always pretty cool to have such big music personalities in the area and to feel the energy from the event. Will you be there? Maybe I'll see you! Love this outfit! The colors go together so perfectly! 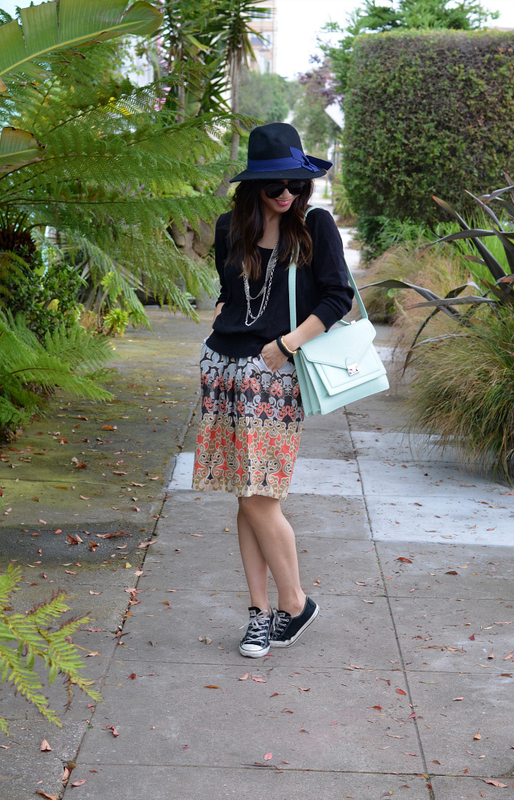 Love the converse with the skirt! Have a great time at the festival. Love your skirt, such a cute print. 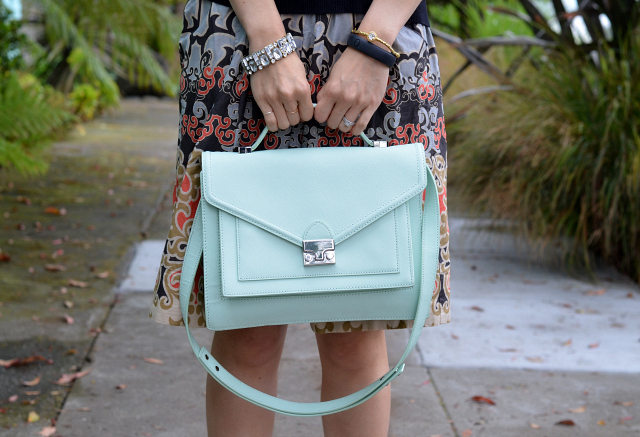 And I love the color of that bag! you're very pretty!! i like your skirt a lots! I would wear this outfit. So fun! I didn't get to attend any festivals the summer, but I wish I had. I hope it's a total blast for you, despite the invasion of so many travelers :). What a great outfit! I love how you make outfits casual with some of your accessories. You're always so good at doing that! Adorable outfit!! So cute!! Check out our fun styles which you will love!! 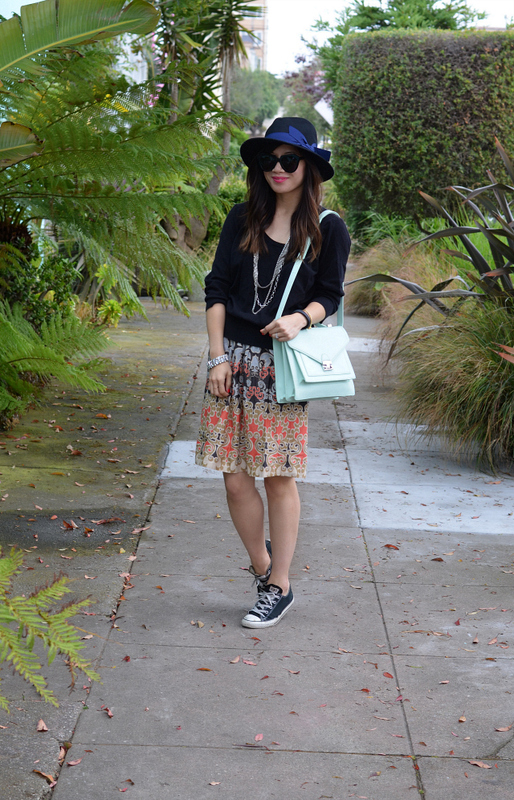 I just adore your hat and how you mixed sneakers into this cute and girly outfit! Love how you pair things that I would never put together and make it look so chic! We live close to a park and when they have concerts we can enjoy them for free - LOVE it! What a cute,casual look! That skirt is lovely! Love the bag too! I like the layers of your outfit!! that hat and skirt are darling!!! I love it all with the chucks! such a cute look! Thanks for the comment, the outfit is soo lovely! Love the blog! follow you, follow back? I'm not a huge fan of the skirt but it matches nicely! You're really good at matching funky patterns.